Paul Sponseller, chief of the Division of Pediatric Orthopaedics, with an eye on reducing severe spinal curves. 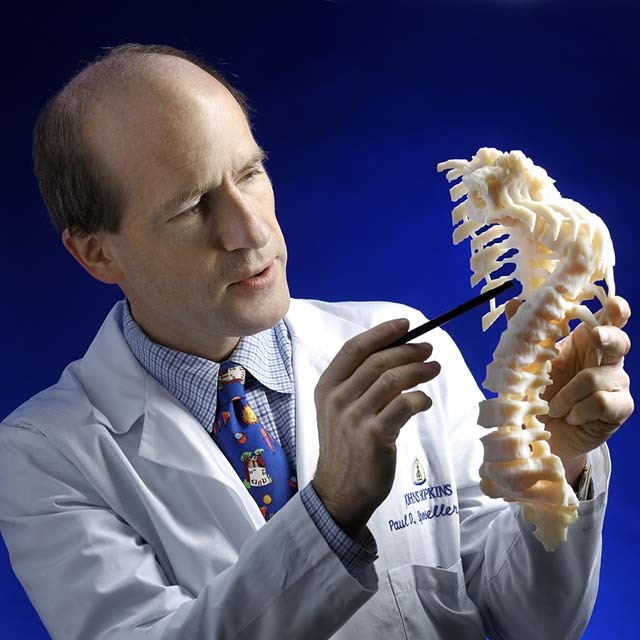 Today there is no shortage of effective treatments for scoliosis, from bracing and casting to surgery, said pediatric orthopaedic surgeon Paul Sponseller at Johns Hopkins’ annual Mastering Children’s Orthopaedics conference in mid-September. Among the most innovative treatments, he added, is an externally controlled growing rods approach for severe curves that eliminates the need for repeated expansion surgeries to keep pace with the growing child. How does it work? In the procedure, two rods are inserted—one on each side of the spine—and attached above and below the curve to brace the spine as the child grows. Each rod contains a pair of magnets that, via an external device, facilitate a millimeter-by-millimeter telescoping and lengthening of the rod every three to six months. In the traditional growing rods approach, patients undergo a surgical procedure and hospitalization every six months to lengthen the rods. Both Sponseller and orthopaedic surgeon John Tis use the new growing rods approach. Criteria for patients include significant progressive scoliosis, immature skeleton, and early-onset or idiopathic scoliosis. Sponseller also offers innovative bracing and casting treatments at Johns Hopkins Children’s Center. While bracing usually will not straighten a severe curve, Sponseller notes, it may hold the curve and prevent it from worsening, especially for patients who have normal connective tissue. Bracing, he adds, is less effective for patients with neuromuscular disorders such as cerebral palsy, spinal muscular atrophy and genetic disorders like neurofibromatosis. In those cases, Sponseller recommends a Mehta cast for nine months. Placed on the patient under anesthesia, the cast is designed to de-rotate the spine, stretching it out in the right places and opening spaces the body needs to fill. Families, Sponseller stresses, need to understand that their child will be in a cast 24/7. For more information, call 443-997-2663.